July’s whizzed past in a wave of sunshine and fizzy happiness and life events, so has there been any time for reading blogs? Why of course there has! I actually find I’m most inclined to read blogs when I’m at my busiest- I mean, I first found the blogging ‘world’ whilst avoiding writing essays and reading weighty tomes at university, so I guess not much has changed! ;) I’ve got such a lovely selection of blogs to share with you today, so without further ado, let’s jump in! There’s just something about reading Lou’s blog that just makes me feel calmer. When I’m having one of those silly days where nothing seems to be going right, a browse through The What Now Blog is the quickest route back to a feeling of motivation and inspiration. Louise’s posts centre mainly around career advice and personal wellbeing, with a few lifestyle posts thrown into the mix for good measure. They’re always written with such care and attention to detail, and never fail to leave me feeling ready to tackle my day. If you’ve not already added The What Now Blog to you’re reading list- you’re in for a treat! Favourite post of the past month? Glastonbury Festival: Tales From The Tented City. 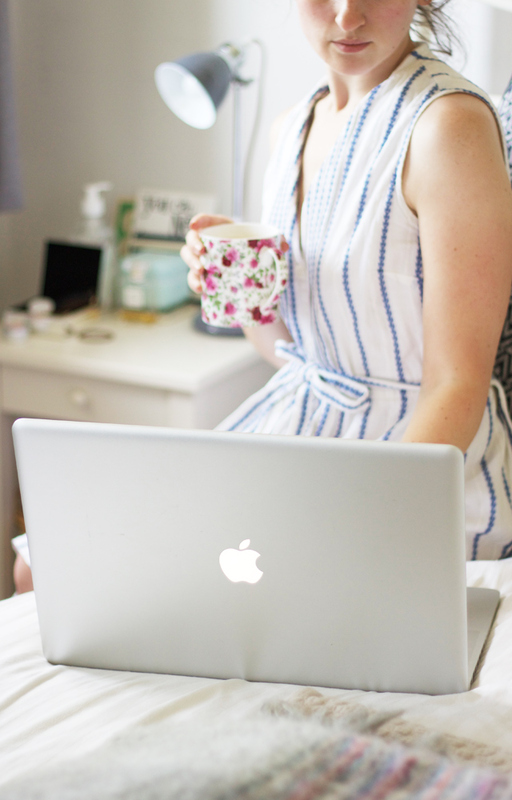 I’m so, *so* very glad to have discovered how amazing Georgina’s beautiful blog is recently! I feel as though I’ve known Georgina via Twitter for ever such a long time now, and can’t begin to think why I’ve not been reading her blog all this time! The Librarian is everything I look for in a lifestyle blog- beautiful photos, sweetly personal writing, charmingly simple adventures…I just love it! I especially adore how Georgina focuses on the little moments that make her most happy- a girl after my own heart, as you can imagine! If lovely recipes and happy lists and beautiful outfits and days out are your cup of tea- then you’ve found the blog for you! Favourite post of the past month? Lincoln Castle + 1940s Weekend. I feel as though I could go on forever about how fantastic a read Angie’s blog is! Silverspoon London is a luxury travel and lifestyle blog, featuring hotel and restaurant reviews, incredible ‘take me along with you!’ travel posts, and so much more besides. I love how passionate Angie is about the topics she covers, and, most importantly, how honest she is when sharing her views about dining and travel experiences. She’s quickly become my ‘go to’ for travel and restaurant recommendations (I’ve already bookmarked her suggestions for our Koh Samui honeymoon!) and I’m am so looking forward to following along with her adventures in the second half of this year! Favourite post of the past month? 10 Reasons Why I Love South Africa. If there’s one thing that’s pretty difficult to accomplish in the blogging world, it’s being totally, 100% unique. There are countless blogs in existence and the community grows every day, so it can be pretty hard to stand out! And it’s for exactly this reason that I admire Brooke so very much- because she’s got the art of staying unique and true to herself down to a fine art! Brooke Meagan Jones is a lifestyle blog, and is so hilarious and well written reading it feels like sitting down having a catch up with a friend! There’s something so very special about Brooke’s way with words- her posts regularly have me laughing out loud, and I mean that quite literally! I can’t recommend you add Brooke Meagan Jones to your reading list highly enough! Favourite post of the past month? Throwing My Weight Around. I’ve adored The Awkward Blog ever since I first clicked through to it, and over the past 18 months or so have followed along as Angela got her two lovely kittens, renovated her flat, and got engaged to her then-boyfriend/now-fiance! The Awkward Blog is a lifestyle focused blog, documenting Angela’s adventures in London. I just love how fun and engaging Angela’s posts always are- her photographs and stories never fail to leave me desperate to head into the city! Her blog is so beautifully polished and super smart, and is the kind that’ll have you hooked from the very first post. You’re going to just adore this one, I know it! Favourite post of the past month? Carsten Holler: Decision Exhibition. Anna in Wonderland is another totally unique and individual blog! On her site, Anna writes interesting think pieces and fun lifestyle and travel posts, and so much more besides. This month, Anna’s shared with us a post about her favourite 90s summer tunes (which sent me running to Spotify! ), written a mini-tutorial about how to update a Blogger design template, and also continued with her weekly travel series in which she interviews expats about their experiences of moving abroad! Isn’t that the most brilliant idea for a blog series? I just love how passionate Anna is in everything she writes, and am so enjoying getting to know her blog! Oh, it’s so nice to have Nicola’s blog linked here in my sidebar once again- I’ve had so much fun catching up on her adventures and nosing through all her most recent posts! Pink Confetti is a lifestyle blog, featuring a myriad of posts covering everything from travel and restaurant reviews, to beauty box ‘unboxings’ and life-lately style round ups. I just love how refreshingly simple and charming Nicola’s posts are- her photographs are so lovely, and her travel posts especially take you right along with her on her adventures! You must go and have a browse through Nicola’s posts from her recent trip to California- she’s given me a serious case of wanderlust! Favourite post of the past month? California; Part One. The Beach Edition! I’m just going to say it- I have a total blog crush on A Little Lusciousness! There’s just something about the simple, unfussy way Rosie presents her content that gets me every time! A Little Lusciousness is a food blog, and on it Rosie shares recipes, restaurant reviews, and details of her pop up supper club! Over the past few weeks, Rosie’s sampled a flight of Laurent Perrier champagne at St James’ Court, announced the date of her July supper club, and shared her thoughts on a meal at Trader Vic’s in Mayfair! A Little Lusciousness is absolutely the place to go for mealtime inspiration- and I’m certain you’re going to just adore it! Favourite post of the past month? 80 Tastes, St James’s Court. Favourite post of the past month? A Countryside Weekend. Michael 84 || Favourite post? Newcastle Fashion Blogger. AimSui, Small and Ted || Favourite post? One.